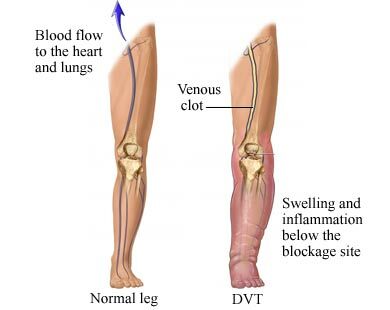 Deep Vein Thrombosis (DVT) is when one or more blood clots form in a deep vein of the body. The most common site for DVT is in the lower limbs. Proximal DVTs of the lower extremity (LE) involve the popliteal and/or thigh veins (femoral vein, external iliac vein, deep vein of the thigh), while distal DVTs encompass those that develop in the calf. DVTs in the upper extremity (UE) are less common (4-10% of all cases). The deep veins of the upper extremity include the jugular, brachiocephalic, subclavian, and axillary veins proximally and the brachial, ulnar, and radial veins distally. In the upper extremity, the subclavian, jugular and axillary veins are the primary vessels in which DVTs form. Thrombi develop as a result of hypercoagulation and stasis around venous valve sinuses. The majority of deep vein thrombi start in the calf. These clots are firm and are mostly made up of fibrin and red blood cells (see the image of a DVT here). On autopsy, the majority are attached to venous walls. Within 72 hours, an estimated 50% of intraoperative calf DVTs resolve on their own. About 1 in 6 of these extend into the proximal veins of the leg, causing venous obstruction and damage to affected valves. A subset of proximal DVTs become mobile and progress to pulmonary embolism (PE), a potentially fatal condition. The incidence of PE is more common in LE than UE DVTs. Risk factors more prominent in children include sickle cell disease, severe infection, antiphospholipid syndromes and trauma. In the original scale, the total score for all items is tallied and the probability of the patient having a DVT is as follows: 0= low probability, 1-2 points= moderate probability,and ≥ 3 points= high probability. An updated version simplifies the scoring process into two categories: < 2 points= DVT unlikely, ≥ 2 points= DVT likely. Well's Criteria is a valid tool for assessing DVT risk in outpatient and trauma patients. It is less useful for stratifying risk in cancer patients and hospitalized patients as a whole. It cannot be used to screen for UE DVT. The clinical diagnosis of DVT is unreliable. However, in combination with valid screening tools, clinical examination can justify the need for diagnostic testing. Clinical observation and palpation should focus on identifying the signs and symptoms described in the "Clinical Presentation" section of this article. Homan's Sign has been used as an indicator for LE DVT since the 1940s. The test is performed by forcefully dorsiflexing the ankle while the knee is extended. Pain and tenderness in the calf is said to be indicative of LE DVT. Despite its historical use, Homan's sign has no diagnostic value. Diagnostic testing is the only definitive way to confirm DVT. D-dimer testing is a simple blood test of fibrin degradation. D-dimer levels are increased by any condition that produces fibrin, one of the primary components of deep vein thrombi. The negative likelihood ratio is higher than 99%. According to Wells and colleagues, the test is best used to rule out DVT in outpatients with a low probability of proximal DVT. Venous ultrasound is considered to be the first-choice, diagnostic test for patients who are symptomatic and stratify into the moderate and high probability risk groups for Well's Criteria. The test is a safe, non-invasive and inexpensive. Depending on availability, patient characteristics and the location of the suspected DVT, compression ultrasound, duplex ultrasound or color Doppler imaging may be used. The sensitivity and specificity of compression ultrasonography averages 95% for detection of proximal DVT. Venography is considered the gold standard test for DVT. The test is rarely used due to its invasive nature and the availability of accurate, non-invasive options (ex. D-dimer and venous ultrasound). The procedure involves an x-ray of the veins (venogram) taken after a special dye is injected into the bone marrow or venous vessels. A combination of mechanical and pharmacological measures can be used to prevent DVT. Mechanical prophylaxis involves the use of graduated compression stockings (GCS), intermittent pneumatic compression (IPC) and venous foot pumps to improve blood flow in the deep veins of the leg. Common agents for pharmacological prophylaxis include Warfarin, subcutaneous unfractionated heparin (UFH) and low-molecular-weight heparins (LMWH). DVT prevention is most effective when both methods are used simultaneously. In medical and surgical patients ambulation and exercises involving ankle dorsiflexion are encouraged to further minimize venous stasis. Anticoagulation is the usual treatment for DVT. Patients are generally initiated on a brief course (i.e., less than a week) of heparin treatment. If heparin is contraindicated, fondaparinux (FDX) or direct oral anticoagulants (DOAC) [ex. Xarelto, dabigatran, apixaban] may be used. Acute DVT treatment is followed by a maintenance course (typically 3-6 months) of warfarin or other Vitamin K inhibitor. 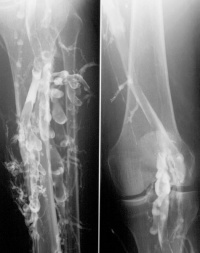 Variations in treatment may exist for patients with delayed removal of an intravenous catheter or an ongoing tumor disease in the case of UE DVT. Although rarely indicated, thrombolytic therapy is used to treat extensive blood clots. A meta-analysis of randomized controlled trials by the Cochrane Collaboration shows improved outcomes with thrombolysis, though this benefit comes at the increased risk of serious bleeding complications. IVC filters may prevent pulmonary embolisation and is an option for patients with an absolute contraindication to anticoagulant treatment. Most newer filters can be removed at a later date, if desired. Complications of this intervention include filter erosion, filter migration and obstruction of the inferior vena cava. In conjunction with anti-coagulation, bed rest is commonly prescribed in the immediate days following the diagnosis of LE DVT. This practice is applied with the intent of preventing clot dislodgement and the incidence of PE. The theoretical basis behind this protocol has not been supported by the literature. According to a systematic review, early ambulation is associated with fewer incidences of new PE and decreased mortality. As such, early mobilization is instrumental for the prevention of DVT sequelae (see the next section on "Implications for Physical Therapy Practice" for guidelines on safe patient mobilization following known DVT). To prevent DVT recurrence, the application of graduated compression stockings is recommended "beginning within 1 month of diagnosis of proximal DVT and continuing for a minimum of 1 year after diagnosis". Encourage patient mobility and physical activity at the individual and institutional level. Screen for DVT risk using Well's Criteria or the preferred risk assessment model of the treating institution. Communicate screening results and relevant clinical signs and symptoms to the medical team. Provide education on the importance of seeking medical attention for suspected DVT. Verify initiation of anticoagulation and type. Determine if therapeutic levels of anticoagulation have been achieved. Verify placement of an IVC filter. Consult with the medical team regarding mobility vs continued bed rest. Engage patients with known DVT in safe mobilization (review section 3 of this table for details). Provide education on the risks and benefits of mobilization following DVT. Patient education should be given throughout the DVT prevention and management process. Patients should have the autonomy to decide if they want to engage in recommended prevention and treatment measures. This presentation, created by Carleen Jogodka as part of the Evidence In Motion OMPT Fellowship, discusses differential diagnosis for venous thromboembolism. ↑ 1.00 1.01 1.02 1.03 1.04 1.05 1.06 1.07 1.08 1.09 1.10 1.11 1.12 1.13 1.14 1.15 1.16 1.17 Kesieme E, Kesieme C, Jebbin N, Irekpita E, Dongo A. Deep vein thrombosis: a clinical review. J Blood Med 2011; 2:59–69. ↑ 13.0 13.1 13.2 Riddle DL, Wells PS. Diagnosis of Lower-Extremity Deep Vein Thrombosis in Outpatients. Physical Therapy. 84 (8); 729-735. ↑ 14.0 14.1 Snow V, Qaseem A, Barry P, et al. (2007). "Management of venous thromboembolism: a clinical practice guideline from the American College of Physicians and the American Academy of Family Physicians". Ann. Intern. Med. 146 (3): 204–10. ↑ Decousus H, Leizorovicz A, Parent F, Page Y, Tardy B, Girard P, Laporte S, Faivre R, Charbonnier B, Barral F, Huet Y, Simonneau G (1998). "A clinical trial of vena caval filters in the prevention of pulmonary embolism in patients with proximal deep-vein thrombosis. Prévention du Risque d'Embolie Pulmonaire par Interruption Cave Study Group". N Engl J Med 338 (7): 409–15. ↑ Snow V, Qaseem A, Barry P, et al. (2007). "Management of venous thromboembolism: a clinical practice guideline from the American College of Physicians and the American Academy of Family Physicians". Ann. Intern. Med. 146 (3): 204–10. ↑ Dutton. Orthopaedic Examination, Evaluation, and Intervention. McGraw Hill; 2004. pg 261, 1338, 1367.